Of all the attempts at constructing a colour-system with the aim of providing standard samples according to a logically organised plan while at the same time catering for the perceived affinity of colours, the effort by the American painter Albert Henry Munsell (1858-1918) is generally considered the most successful. Based on the principle of «perceived equidistance» — to use the correct, although rather long-winded technical term — it is certainly one of the most widespread and commonly used. 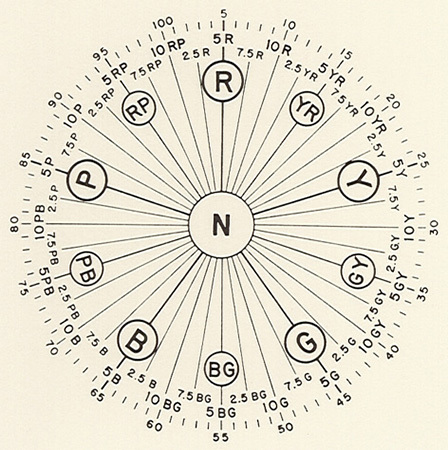 When he proposed his rather inconspicuous colour-sphere (A Colour Notation, 1905), Munsell was still influenced by N. O. Rood‘s «Modern Chromatics» (1879). As he began with his painted samples, however, he realised that a geometrically symmetrical solid was unable to portray the opposing relationships between the colours as we perceive them. The variation between the brightness of pure chromatic colours is too great to be arranged in sequence along the equator: yellow, for example, is brighter than red, which is in turn brighter than violet. 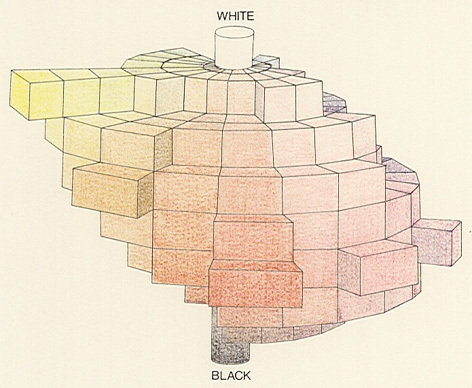 Munsell’s efforts at constructing a system in which the spacing between each colour and its neighbour could be perceived as equal culminated in the publication of his Colour Atlas in 1915. He introduced an order of colours — also known as a «coulor tree» due to its irregular outer profile — grouped around a «naturally grown» central vertical grey-scale. Munsell constructed his system around a circle with ten segments, arranging its colours at equal distances and selecting them in such a way that opposing pairs would result in an achromatic mixture (compensativity). Munsell organised the hues of the hand-painted panels which make up the tree according to three variables, as included in his rather individual system of naming. His parameters are hue, value (the index for brightness) and chroma (the gradations of saturation). Each colour is characterised by a triple block, symbolically understood as H/V/C (to be more closely explained). With this as his basis, Munsell went on to develop the entire system using spinning colour-tops to define the mixtures while entrusting the final judgement to his eyes. The vertical value-scale divides the area between black and white into 10 steps (which Munsell determined using a photometer of his own construction). He does not simply define these gradations according to linear changes in reflection but selects a scale in which the square root of the measured reflected intensity is subjected to uniform change (see also Ostwald‘s system). After setting up his value-scale, Munsell selected samples from red (R), yellow (Y), green (G), blue (B) and purple (P) which to him — and his painter’s eye — appeared equidistant not only from each other, but also from a grey of the same value. These became the basic hues of his system, and he provided an additional five mixtures — yellow-red (YR), green-yellow (GY), blue-green (BG), purple-blue (PB) and red-purple (RP) — arranging them in a circle around the previously mentioned neutral grey (N). The parameter Chroma 5 was arbitrarily assigned to all these ten main colours and their mixtures. 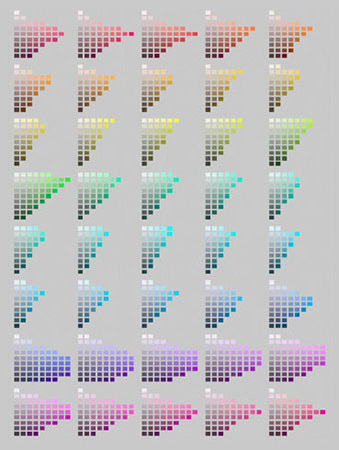 The chroma scale is an open-ended scale and can reach values of up to 12 and 14 depending on the intensity of the colours used. Vermillion, for example, reaches this extreme position and is correspondingly abbreviated to 5R 5/14 in the Munsell notation, while pink, which is less saturated, is defined as 5R 5/4. The outer graduations of the colour-circle show how a total of 40 hues are created by dividing the original five colour-hue intervals between the main hues, first into 10 then 20 and finally into 40 segments, once again in such a way that they will be perceived as equidistant. Their individualistic sounding names are also included. 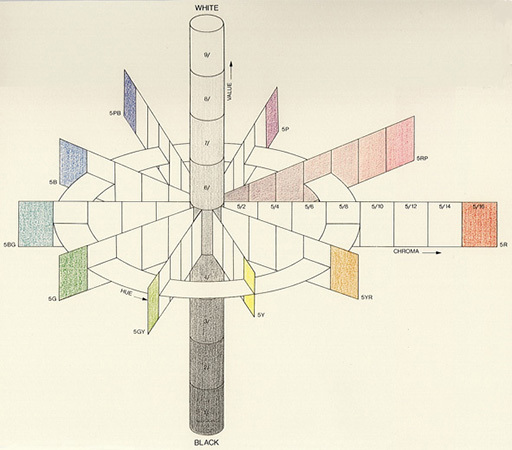 A new Colour Atlas appeared in 1929, after Munsell’s death — this time under the title The Munsell Book of Colour. We still use this edition today. In 1942, the American Standards Organisation recommended its use for specifying the colours of surfaces. The approximate identification of Munsell’s parameters, namely hue, value and chroma, could be confirmed through direct visual comparison with the colour panels themselves. A refinement of Munsell’s notation was, however, recommended (to be later implemented in association with the «Optical Society of America» and known as «renotation»). When stipulating a material standard, it is of prime importance to use normal physical methods and develop a basic model into which all other colour systems can be converted. Modern colour researchers would nowadays require Munsell to reconstruct his system using modern colour-measurement techniques. Indeed, the result may have been a unique arrangement that linked his highly sensitive perceptual assessment of colours to their non-empirical registration. The term «colour-valency» implies the property of a colour stimulus which contributes to the effect of a mixture. Munsell, however, depended on mixtures derived from spinning colour-tops, which he then corrected so that any systematic deviations of perceived colours from the modern non-empirical approach were kept to a minimum. Munsell’s colourful tree will blossom for many years to come. Date: One of the most widespread—and nowadays most utilised—colour-systems, this system was developed by the American painter Charles Munsell between 1905 and 1916. 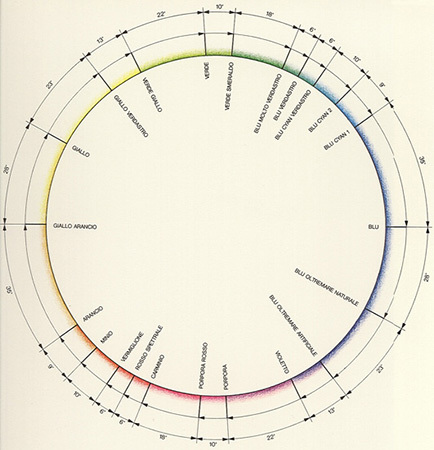 Bibliography: H. Munsell, «A Color Notation», Boston 1905; A. H. Munsell, The Atlas of the Munsell Color System, Boston 1915; F. W. Billmeyer Jr., «Survey of Color Order Systems», Color Research and Application 12, pp. 173-186 (1987). Links: Munsell-system: commercial server with more technical information.